There are only a few days until Google Reader grinds or snaps to a halt. I can’t say I am ecstatic about this but I have been doing a little planning and thinking. My current use of RSS and google reader is as follows: I read, I bookmark to pinboard, tweet links, collect some articles on Instapaper for reading again and I email links to my work and home accounts. Most of this is carried out using Feeddler pro on an iPad, I occasionally also Reeder or more often the GoogleReader site on a mac. I use Feeddler on my iPhone too. Feeddler is, in my opinion, a really good fit for the way I use rss. For example it lets me set a preferred address (well two) which are already filled in with my home and work address, so it is very few clicks to send an interesting link to my work address from my breakfast table. Feeddler also lets me trim down the services it shows, which saves a bit of scrolling. 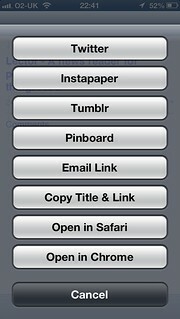 Bought the new version of Feeddler: iPhone-only Pro version. To go with this I got an account on The Old Reader and a trial on BazQux both which sync with the Feeddler. I’ve taken up an account on Hive too. The Free Feeddler app has been updated too, I am really hoping the paid version of the iPad one is updated or there is a new version to buy that supports the pro features, especially the link menu like the iPhone one above. When things settle down a bit, I’ll choose one service to either pay for or donate to. I pay for flickr, pinboard and a few other services, I use RSS a lot more than those and would be delighted to support a good service. I’ve installed the beta of NetNewWire which was the first rss app I ever used. I’ve also set up a few rivers with some of the feeds from my greader export. This is the most interesting development. This uses Dave Winer’s River3 and is starting to get useful. I’ve had a few experiments with river2 and the OPML editor before this, but this one is up and running.